(BELLINGHAM, WA, January 2009) Sheehan World publisher Kathy Sheehan and her "first mate" Chuck Dingée will exhibit photographs at the Blue Horse Gallery in Bellingham during January. The two principals of PhotoSynergy are participating in the second annual "Public Hanging" art exhibit at the gallery. Sheehan and Dingée's photographs will hang among dozens of works by professional and amateur artists from the Pacific Northwest in the non-juried exhibition. The public is invited to vote on their favorite piece of art and to attend an opening reception on Jan. 9. Sheehan, who was part of the inaugural 2008 Public Hanging exhibit, will show a photo titled "Uncle Froggy" this year. 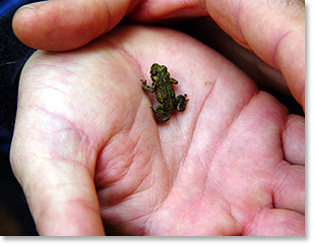 The color photograph was taken in October 2002 and shows a tiny, tiny frog in Dingée's hand. Sheehan's "Uncle Froggy" photograph was previously shown at an exhibit at Western Washington University and was used in promotional materials at the university several years ago. Dingée is entering an artistic photo he took off the couple's sailboat last summer while anchored at Eagle Harbor, Cypress Island. 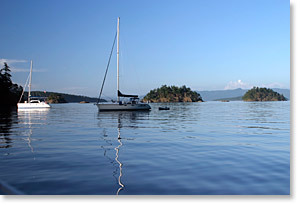 It shows two sailboats anchored nearby, with small islands and the Cascade foothills in the background. "It's the first time I've exhibited one of my photographs in a bricks-and-mortar gallery," he said. Both photos are available for sale at the Blue Horse Gallery or through PhotoSynergy. The Blue Horse Gallery is at 301 W. Holly St. at Bay Street in Bellingham. The Public Hanging 2009 exhibit runs Jan. 9-30.